Scooper - Technology News: Skills shortage or low demand: What's causing low US employment? Skills shortage or low demand: What's causing low US employment? One of the primary explanations we’ve heard for today’s low employment rate is that workers don’t have the right skills to land jobs in today’s economy. This line of thinking is often employed by people who argue that monetary and fiscal stimulus are unnecessary since the problem can’t really be lack of demand. There are a host of reasons to suspect that this explanation is wrong. 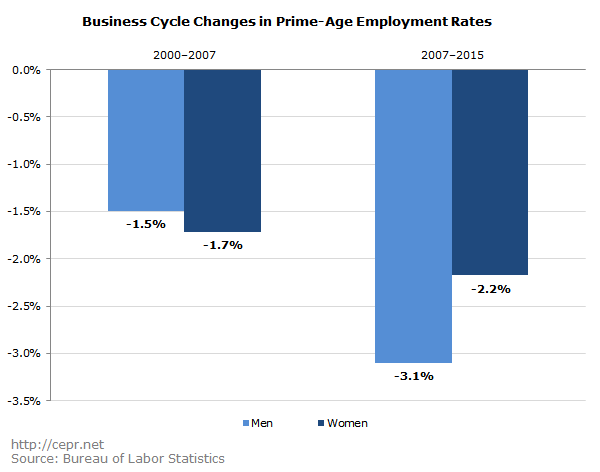 One such reason is the decline in prime-age (25 to 54) employment for both men and women since 2000. 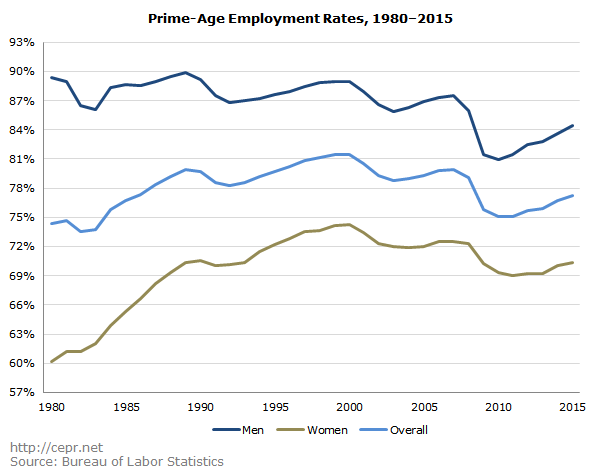 During the 1980s and 1990s, the prime-age employment rate increased at a steady pace. This was driven primarily by women moving into the workplace. In 2000, the employment rate of prime-age women reached an all-time high of 74.2 percent. Men did not seem to experience worse job prospects as a result of this shift, as the male prime-age employment rate hit a ten-year peak of 89.0 percent. This can be seen in the figure below. However, since peaking in 2000, the prime-age employment rate has fallen for both groups. After dropping from an all-time high of 81.5 percent in 2000 to a trough of 78.8 percent in 2003, the prime-age employment rate climbed back up to 79.9 percent in 2007. When the financial crisis struck, the prime-age employment rate fell to 75.1 percent in 2010-2011; and by 2015, it had only recovered to 77.2 percent, nearly 3 percentage points below its 2007 rate and over 4 percentage points below its 2000 rate. The graph below displays the net changes in employment rates from business cycle peak to business cycle peak during the 2000s. Employment fell in both cycles for menand women — and the falls have actually been quite similar in scale. This history should pose a serious challenge to those who push the “skills shortage” story over the “low demand” story. Which is more likely — that both men and women experienced a decline in skills in the early 2000s, a recovery in skills in the mid-2000s, a second drop in skills in the late 2000s, and then another improvement in skills since 2011…or that there has been a more general problem in the labor market which has negatively affected both groups? The data support one explanation more than the other.